Contribute to building a 100 reasons list. The Volunteer Circle is definitely a vital tool in remedying some of the problems facing Lebanon today. It almost feels like a no-brainer, a thing that should already exist. Antami is a social initiative to involve the community into solving the pressing social needs of families and children. Since its launch in 2012, the organization has designed many activities and events tackling the intellectual, humanitarian and developmental aspects of the Lebanese society. Efforts have been particularly directed at providing financial assistance to students in need. ‘Paint Up!’ is the brainchild of co-founders Lana Chukri and Jubran Elias. After establishing a team of talented and bright designers with whom they graduated with called “Dihzahyners” – the duo brought the team together in 2012 to recreate and rejuvenate broken and gloomy spaces in Beirut through a series of urban and street art initiatives that were later known as “Paint Up!” volumes. In developing this, their social enterprise and non-profit organization was born and began evolving into a living, breathing entity that resonated with artists, enterprises, and people worldwide. The name ‘Dihzahyners’ comes from the dictionary enunciation of the word “designers”. The sole difference is while one is the name of the team; ‘Paint Up’ is the non-profit organization and series of projects that were created by the team themselves. We always like to represent ourselves as ‘Dihzahyners’, even in media and social coverage – as one of our main ideals is that nothing can be built and sustained without a team, as a whole. Are You an Organization ? 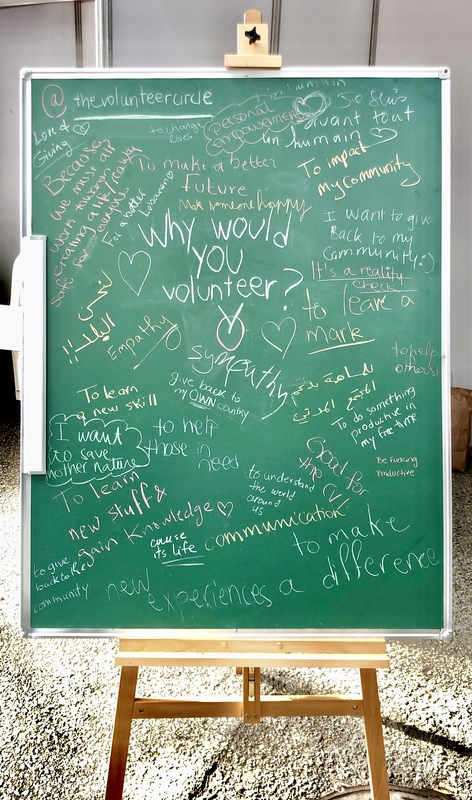 Are You a Volunteer ? Thank you to every person who came by! You reminded us why @TheVolunteerCircle is the only and first online stop you need to volunteer in Lebanon. Participating in the AUB/USJ NGO Fair couldn’t have gone better. We’re happy to have connected with you and got to know enthusiastic people who are ready to take local social impact to the next level. Together, we form a community that houses all non-profit organizations and volunteers in the region. Beyond that, our platform is for locals and people from every walk of life who see a piece of themselves reflected in their own community. Welcome to the Circle! 𝗟𝗲𝘁’𝘀 𝗺𝗮𝗸𝗲 𝘁𝗵𝗲 𝗰𝗶𝗿𝗰𝗹𝗲 𝗲𝘃𝗲𝗻 𝗕𝗜𝗚𝗚𝗘𝗥! WE ARE NOW LIVE!⁣ ⁣ The Volunteer Circle is bringing you the most personalized skill-sharing experience to date.⁣ ⁣ You can now visit our website, create a profile and begin your volunteer and skill-sharing journey in Lebanon. Simple, isn’t it?⁣ ⁣ It takes 3 minutes to sign-up and gain instant access to a wide range of NGOs & local initiatives that need your time and skills to help them grow! Today more than ever, it is time to take charge. Join the circle, and get active! Together, we can move mountains, so let’s start today and build culture! ⁣ ⁣ 𝗧𝗮𝗴 𝘁𝗵𝗲 𝗳𝗶𝗿𝘀𝘁 𝗽𝗲𝗿𝘀𝗼𝗻 𝘁𝗵𝗮𝘁 𝗰𝗼𝗺𝗲𝘀 𝘁𝗼 𝘆𝗼𝘂𝗿 𝗺𝗶𝗻𝗱 𝘄𝗵𝗼 𝗰𝗼𝘂𝗹𝗱 𝗯𝗲𝗻𝗲𝗳𝗶𝘁 𝗳𝗿𝗼𝗺 #𝗧𝗵𝗲𝗩𝗼𝗹𝘂𝗻𝘁𝗲𝗲𝗿𝗖𝗶𝗿𝗰𝗹𝗲. ⁣ ⁣ What goes around comes back around. It’s time to empower yourself and the people around you. Let’s make the circle bigger. IT’S YOUR TURN NOW! Smile to an era where volunteer and creativity sound like the perfect harmony. Devotion meshed with skills, always wins. Any body that has a soul is worth caring for. Take a moment to give a moment. How does receiving personalized suggestions to volunteer opportunities sound? We’re making it happen. Keep watching our space for the latest updates about our launch! Volunteering gives you the power to support a cause that you are passionate about or a project that you are genuinely interested in. It also goes beyond that. Talk about restoring someone’s faith in humanity. How beautiful is it to leave a positive mark on someone else’s journey only to realize they have added meaning to yours? Allow us to paint a picture of color therapy. Keep watching our space for a fresh & personalized approach to volunteerism in Lebanon! Stay up to date on the latest events, new listings & opportunities.